Remember the milk man? He came to our house in the dark of night/early morning and left whatever had been ordered in the metal milk box by the back door. Of course, milk came in glass bottles at that time, and he would take the empties and replace them with fresh milk and whatever else was ordered. 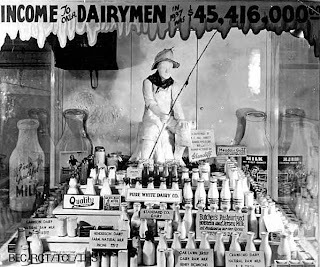 When we moved “out in the country” it was probably more necessary than ever to have milk delivered, since grocery stores hadn’t yet been built all the way out at 51st and Memorial. I suspect ours came from the Meadow Gold plant that was located at 51st and Garnett. The Farm shopping center was actually a real dairy farm. This is the Tyrrell dairy farm. 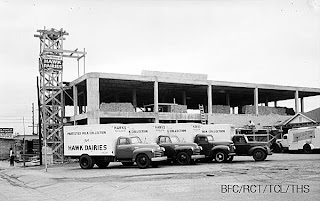 Another popular dairy company for many years in Tulsa was Hawks Dairy. It was headquartered on the northeast corner of 11th and Lewis where products were processed and the truck fleet was located. When their building was built in 1947-48 it included a retail outlet which, of course, sold ice cream on a cone and was very popular. Hawk’s dairy farm was located in Owasso and their products were sold in grocery stores in the surrounding states. Here is my Mom hawking Hawks (probably for a Sipes ad) in the early 1950s. The company closed in 1961. Love that java Christmas card! This makes me realize how much the dairy business has changed in the last 50 years. 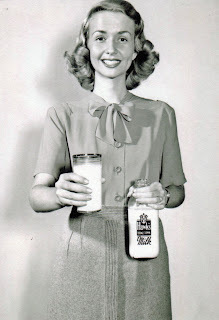 When I was a kid we had milk delivered by Meadow Gold, and there were lots of local dairies. They are all gone and I wonder were the milk comes from that is often sold under store brand names? T'aint like it used to be. Great post! My grandfather was a milkman back in Pennsylvania. He used to wake up at 3:00am to go to work, so I'm told. 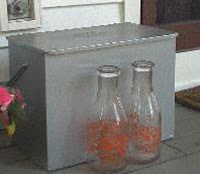 i remember the milkman coming to our home. We had Twin Pines milk here in Michigan. What neat memories! your mom was so pretty! Our milkman was named Gene! Borden Dairy of Oklahoma is located at 215 N. Denver in Tulsa, Oklahoma; it was originally known as the Oklahoma Dairy founded by Mr. Early Russell Cass. 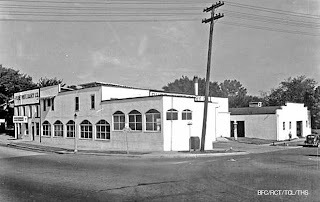 On April 1, 1926 the dairy was bought by Beatrice Creamery Company. Mr. Cass was named General Manager and held that position until his retirement on February 28, 1963. 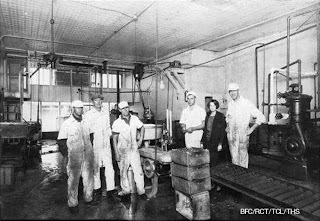 On November 20, 1924 the Beatrice Creamery Company was re-incorporated and licensed with headquarters in Chicago, Illinois. 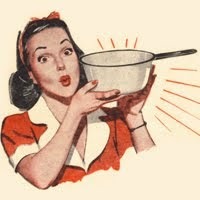 The name Beatrice Foods Company was adopted on June 24, 1946 and became a processor of a complex line of dairy products. 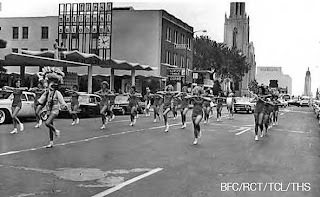 By the 1980’s the Beatrice Foods Company had grown to an international diversified company with 80,000 employees and operations in 28 countries. Beatrice business spanned a wide spectrum of dairy and consumer foods products with other businesses as diverse as luggage, travel trailers, lamps, lawn sprinklers, furniture, wall coverings, and plumbing supplies. In 1986, the dairy operations of Beatrice Foods Company were sold to Borden Inc., and the company began operating under the Borden/Meadow Gold name. In 1998 Borden Inc. sold the dairy operations to Southern Foods Group. In 1999 the Tulsa facility made a switch to the Borden name using the Borden, Meadow Gold and Viva logos due to marketing strategies. Opportunity continued with a merge between Suiza in 2000 and Dean Foods in 2001. During the early days of Borden/Meadow Gold, horse drawn milk wagons were in use. The milk was kept cold with blocks of ice. 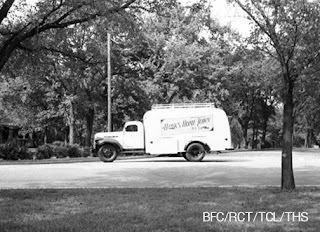 In the mid 1940’s refrigerated milk trucks were introduced to the dairy business. The business was serviced by home delivery with over a hundred and fifty home delivery routes in 1960. Over the years the market has changed from wholesale to retail. Home delivery service no longer exists, replaced by a modern transportation system that delivers our products throughout the geographical area. The Tulsa facility today, still at 215 N. Denver, measures almost 100,000 square feet, produces and distributes a range of products including fluid milk, buttermilk, ice cream mixes, juices, and fruit drinks. The ice cream department consists of a large low temperature storage vault that inventories approximately 50,000 gallons of ice cream. Our ice cream is supplied to us by Southwest Ice Cream Specialties in McKinney, Texas. The company produces its own plastic jugs for fluid milk bottling purposes. Dean Foods Company employs approximately 250. The company is strong in Oklahoma because of the Borden Tulsa name. I am looking for any information and pictures of a Jersey dairy called Shawco farms of tulsa, OK.
My father worked for Judge Shaw who owned the dairy. He worked from 1940-1945. My mother worked at the Douglas plant across the street. 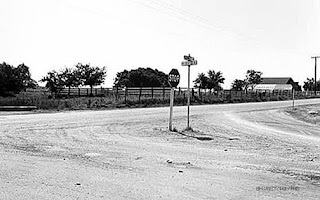 I think the street is Mingo rd or old highway 75. We were there last week but there is nothing left. I also think American Airlines owns the property. My dad delivered door to door with the label that read "Genuine Jersey Milk". Carolyn, I haven't come across anything with that name but will keep my eyes open for it. While cleaning out my Mothers storage shed today, I found a milk can from the Hawks Dairy. The markings on the side appear to be HAWKS SI, TULSA. Any information about this piece would be appreciated. You may contact Si Hawks if you would like more information about it. I cannot find his personal email address but he is on Facebook- you can contact him there at https://www.facebook.com/sihawk If you want to take a photo of it and send it to me I will add it to this blog entry. Thanks! I have found a gallon glass milk jug with a wire handle. 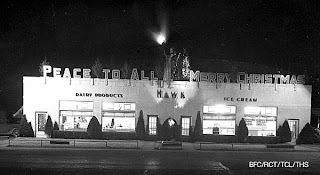 It reads "Hawk's South Side Dairy. Highest Quality Dairy Products since 1905". I can not find anything online about the dairy. Do you have any information on it? Re: Hawks Southside Dairy. SOUTHSIDE Dairy was in OKC. Hawks bought Southside and the name became Hawks Southside Dairy. Then, Hawks sold out and the name changed to Gilt Edge. Gilt Edge was sold and continued with its name until it became Hiland Dairy. Nelson's: It Really Is (Still) All That!